BLOOM IS BACK (since 2010!) - nearly 10 years! Past events until re-launch in Spring 2010! on Friday 12 April and Saturday 13 April in the Precinct/Calverley Road! On the Community pages of the LOCAL published by Tunbridge Wells Borough Council: "Bloom 2019"
Competition Entry Form is available now too! Many thanks to TWBC's Communications/Publications team. Many thanks to TIMES OF TUNBRIDGE WELLS. together with the Hospice in the Weald. For all "Green Fingers" in our town! It is official - Royal Tunbridge Wells is in the finals of the Royal Horticularal Society (RHS) BRITAIN IN BLOOM competition 2019! Royal Tunbridge Wells took part in the 2018 Britain in Bloom finals and achieved the Silver Gilt award. 'South and South East in Bloom' decided to put forward RTW once more to the national competition to represent South & South East in the Large Town category. RHS Media Centre - Pressrelease "Finalist 2019"
RHS Britain in Bloom - Pressrelease "Finalist 2019"
Tune in and scroll forwards to listen to programme's minutes 51:30 - 55:00 RTW in BLOOM on Radio Kent "Sunday Gardening"
NEWS for Royal Tunbridge Wells! 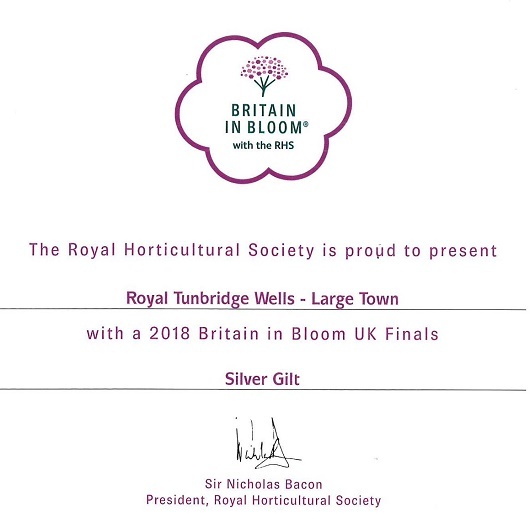 Royal Tunbridge Wells (large town) wins SILVER GILT at the BRITAIN IN BLOOM finals 2018. The RHS - Royal Horticultural Society - Britain in Bloom UK Finals awards are held in Belfast this evening 19 October 2018. After a full calendar year of hard work and two months of anticipation following the judging (in July and August), the 76 Britain in Bloom UK finalist groups (including Royal Tunbridge Wells - large town) will finally discover tonight whether they've received a Bronze, Silver, Silver Gilt or Gold Medal. One group in each category will also win a coveted trophy. Follow #BritainInBloom on Twitter from 5.30pm for all up-to-date news! This past summer, Royal Tunbridge Wells in Bloom and Assembly Hall Theatre teamed up to bring the outside, inside this Autumn. With help from local budding photographers, we collected photographs of our town, parks and borough looking 'Blooming Marvellous!'. Informing RTW Town Forum members about RTW in Bloom at their meeting on Thursday 27 September 2018. The awards ceremony for the various "BEST" categories in the town was held at the No. 1 Warwick Park Hotel (Function Room - The Old School @Chapel Place) on Wednesday afternoon, 26 September 2018. Every entrant (residential or commercial and participating schools) received a certificate or glass trophy and a "goody bag". Do browse through the 250 photos and find yours! This week, on Friday 14 September 2018 the BLOOM Team will know the result for South and South-East in Bloom. Awards Ceremony will take place in the Falmer Stadium, known as the American Express Community Stadium, near Brighton and Hove, Sussex. Photos submitted for the slideshow at the BRITAIN in BLOOM Awards Ceremony in Belfast in October 2018. The awards ceremony for the various "BEST" categories in RTW will be held at the No. 1 Warwick Park Hotel (Function Room - The Old School @Chapel Place) on Wednesday afternoon, 26 September 2018. Every entrant will receive an invitation. The Bloom team will hand out a certificate or glass trophy and a "goody bag". despite heatwave and wilting plants"
The RHS 'Britain in Bloom' judges, Rae Beckwith and James Cordingley, liked the portfolio! - Browse through and find out about BLOOM! "ROYAL TUNBRIDGE WELLS IN BLOOM TO BE JUDGED NEXT WEEK - DESPITE HEAT BROWNING GARDENS"
What has the Bloom Team been up to during 2017/2018? "Green Flags awarded to a record six parks"
"Top gardens under inspection as judging start"
Royal Tunbridge Wells Town is being judged in the National BRITIAN in BLOOM competition on Monday 30 July 2018 and the Bloom team are busy making the final preparations for the day. Invitations have been sent out to attend a lunch on the terrace at Dunorlan Park and supporters/volunteers/sponsors of RTW in BLOOM will have an opportunity to meet our National judges Rae Beckwith and James Cordingley. Have you spotted the biggest bee in RTW? ... together with the School Competition displays (on "beehives") close to Library & Museum! - Judging of the town RTW in the South & Southeast in Bloom competition. Get your cameras at the ready!" Submit your BEST photo until Monday 20 August 2018! An EXHIBITION of the 25 BEST will be held at the Assembly Hall from September to November 2018. Many thanks to Sarah Hamilton-Walker, Editor, Index Magazine. The planting of "purple white green", the 'Suffragettes colours' or 'Vote for Women' in Royal Tunbridge Wells. "IT'S THAT 'BLOOMING TIME OF YEAR AGAIN!" on Monday 30 July 2018, part of Britain in Bloom (RHS Bloom). Summer is here! Glorious sunshine forecast for the next weeks! "Join our BLOOM Campaign & Competition""
- BLOOM in the 1st edition (p.63)! Tickets are now available for the ROYAL TUNBRIDGE WELLS OPEN GARDENS TOUR on Sunday 17 June 2018 or you can buy a ticket on the day at one of the 8 participating gardens. "ROYAL TUNBRIDGE WELLS IN BLOOM LAUNCHES FOR 2018"
Why is the Britain in Bloom competition important for Royal Tunbridge Wells? Have you spotted the "ROYAL TUNBRIDGE WELLS IN BLOOM Launch 2018" poster in all the parks in RTW? Many thanks to the Town Crier! in "SOUTH & SOUTH-EAST IN BLOOM". 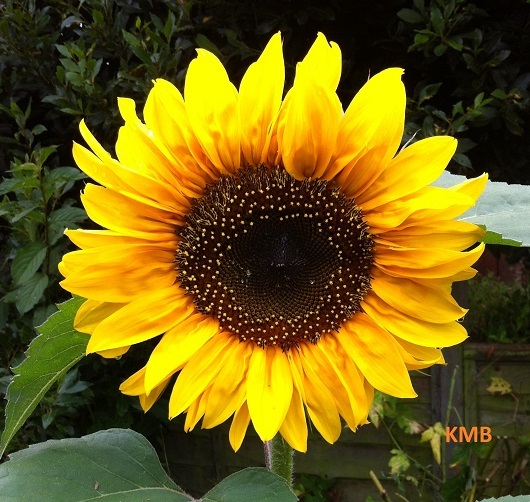 "It is going to be a very busy year for Royal Tunbridge Wells in Bloom"
Additionally to the "BEST" competition 2018 we will have the SUNFLOWER competition! Who will have the tallest sunflower? It is official - Royal Tunbridge Wells is amongst BRITAIN IN BLOOM finalists 2018! Judging of RTW will take place in the summer in the "Large Town" category, representing South & South East region. Royal Tunbridge Wells will compete with 8 other large towns from across Britain. The BLOOM Team will have a stall near the entrance to Grosvenor Park (close to the Hub) and distribute competition leaflets and goodie bags. Join Friends of Grosvenor and Hilbert Park as their festival of Family Fun returns with its usual mix of food, drink, music, donkey rides, bouncy castle fun and much more. BRITIAN in BLOOM - The Nationals! Royal Tunbridge Wells (large town category) will be judged end July 2018.
on Friday 13 April 2018 and Saturday 14 April 2018 (10am -3pm). "About Royal Tunbridge Wells in Bloom"
Following the success of the Open Gardens event this year, we are organising a similar event for Summer 2018 - Would you like to help promote the BLOOM competition and support the Hospice in the Weald at the same time? To participate in the Open Gardens scheme all you need to do is open your garden to visitors. Open Gardens Tour will be held on Sunday 17 June 2018. "RTW in Bloom 2017 Results"
You're going to Love Your Community? The Bloom Team will have a stall at King's Charles The Martyr Church Hall on Saturday 4 November 2017, 11am -1pm. To find out more do pop along and "JOIN OUR BLOOM CAMPAIGN 2018"! There are photos of everyone! PHOTOS of Award Ceremony 2017. The awards ceremony for the various "BEST" categories was held at the No. 1 Warwick Park Hotel (Function Room - The Old School @Chapel Place) on Wednesday afternoon, 27 September 2017. Every entrant received a certificate or glass trophy and a "goody bag". "The People's Choice Park Award - for Dunorlan Park".
" We took on the immense task of putting the 332 certificates in order ready for the 2017 S&SEIB Awards. This is made up of 103 In Your Neighbourhoods, 4 Bronze, 26 Silver, 93 Silver Gilt and 79 Gold certificates alongside 27 Discretionary Awards and 49 Trophies. at The Copthorne Effingham Gatwick Hotel !! " S & SE in Bloom. Wednesday 20 September 2017 South and South-east in Bloom Awards at the Copthorne Hotel, Effingham, Surrey. Wednesday 27 September 2017 Royal Tunbridge Wells in Bloom Awards at No. 1 Warwick Park Hotel (Function Room). "Open Gardens welcome ever-growing audience"
RTW in Bloom team was fund-raising with Hospice in the Weald (1 Aug 2017). Anyone living in Royal Tunbridge Wells who is interested in opening their garden for one day in the Open Garden scheme during the next summer (2018) please do get in touch. Please participate in the TWBC survey as the findings from the survey will feed into the study and be used by the Council as part of the evidence base for the new Local Plan. RTW in Bloom team visited the Hospice in the Weald on 1 August 2017, to deliver money raised during the Open Gardens tour on Sunday 4 June 2017. We would like to thank again all who helped us to organise this event. Would you like to open your garden for the Hospice and Bloom next summer 2018? - Please let us know. "Plea for help in boosting tourism by flower power"
... more support from the commercial sector would also provide an important boost for Royal Tunbrige Wells' tourism and economy. The Bloom Team prepared various portfolios for the Judges of "South and South East in Bloom". The Town ROYAL TUNBRIDGE WELLS in BLOOM was judged by Reg Harrison and Reg Leach on Thursday 13 July 2017. We will know the results for South and South-east in Bloom in September 2017. We have hit a record 216 BLOOM entries! The competition "for BEST" has now closed. Judging will take place week commencing 24 July 2017. ..... to win one of the BEST categories! You can still enter the competition until Friday 30 June! and we are busy with preparations for the visit of South and South East in Bloom judges next month. £2,037.40 from the Royal Tunbridge Wells "OPEN GARDENS TOUR"
on Sunday 4 June 2017. £1,611.10 was raised in tickets sales in advance and on the day (some people made a smaller donation to see just one garden out of the six in the tour) and £426.30 from the raffle, plant sale and cream teas. A massive thank you to all of you who helped the Bloom team in partnership with the Hospice in the Weald and made the day a fabulous success! Sunday 4 June 2017 (11am to 5pm). Thank you for supporting RTW in BLOOM and Hospice in the Weald. "Open Gardens in RTW - Sunday 4 June 2017"
"Celebrating the power of flowers"
.... many residents collected their 'goodie bags'! the "BEES need FLOWERS; FLOWERS need BEES - TALK"
RTW in BLOOM judging dates: . The Town RTW will be judged on 13 July 2017. Dunorlan Park will be judged on the same day in the afternoon. Grosvenor and Hilbert Park and Woodbury Park Cemetery on 7 July. Calverley Grounds and the Cemetery and Crematorium on 11 July. - 50 most floral pubs. Please help us to get Dunorlan Park to the top 50! S&SEiB People's Choice Award vote is now open! Deadline for voting is Friday 11 August 2017. The most voted for entries will be invited to the S&SEiB Awards on 20 September 2017. Thursday 4 May 2017 10am-3pm, Bee Planting Day @ Grosvenor and Hilbert Park. We need volunteers to help fill the beds with soil, then plant them up with 17 project plants. We will meet at the Hilbert Road gate at 10am or come and find us down hill from there. Tea, coffee, biscuits will be provided. Friday 5 May 2017 10am-3pm, Bee Planting Day @ Pepenbury. We need volunteers to help fill the beds with soil, then plant them up with 17 project plants. We will meet in the car park at 10am or come and find us by the donkey field; please sign in at reception on arrival. Tea, coffee and biscuits will be provided. ... We want to win the GOLD again this year! Judging dates have been released. the town Royal Tunbridge Wells will be judged between 3 July and 14 July 2017. The Bloom team has to submit all participating entries by 20 February; portfolios have to be sent in by end of May 2017.
on Friday 21 April 2017 and Saturday 22 April 2017 (10am -3pm). Royal Tunbridge Wells in Bloom needs your help! we are also looking for volunteers to help us plant. "Help transforming neglected areas in RTW into beautiful gardens"
all the participants, volunteers,contractors and sponsors for yet another successful year of our horticultural campaign. As an entrant in the Royal Tunbridge Wells in Bloom competition would you like to help promote our competition and support the Hospice in the Weald at the same time? "Open your garden to visitors for one afternoon in June 2017"
We will be launching the Royal Tunbridge Wells in Bloom 2017 competition in April 2017. The Cross Pollination Project, a three year Heritage Lottery Funded project, was created to raise awareness of bees and pollinating insects, highlight the importance of forage for bees and insect pollinators, show how people can help by growing pollinator friendly flowers in their garden or window box. The awards ceremony for the various "BEST" categories was held at the HOTEL du VIN on Thursday afternoon, 29 September 2016.
bees, (honey bees, solitary species, bumblebees); pollen wasps (Masarinae); ants; a variety of flies including bee flies and hoverflies; lepidopterans, both butterflies and moths; and flower beetles. 29 September 2016. All participants are invited! Many thanks to Emma O'Halloran for the "BLOOM Blog"on the Tourism Website for Tunbridge Wells! Royal Tunbridge Wells has another Green Flag award! It is the fifth Green Flag park in town: Grosvenor and Hilbert Park. in 2015 Calverley Grounds, received their Green Flags. All the judging of the entries for "BEST" is concluded! The Town ROYAL TUNBRIDGE WELLS in BLOOM (South and South East in Bloom) was judged Monday 11 July by Jean Griffin and Nick Hagon. We would like to thank the judges for their visit and comments, and to give a Big Blooming Thank You to all our Partners, Friends and Sponsors. We will know the results for S&SEiB on Wednesday 14 September 2016. Bees are the only insect that make food people can eat. Tunbridge Wells Borough Council LOCAL magazine - Summer 2016 Many thanks to TWBC's Communications/Publications team. "A blooming marvel that just keeps on growing"
Together with the "Love Where We Live" initiative RTW IN BLOOM aims to achieve a litter free, cleaner and greener town. The Love Where We Live Awards for 2016 are now open for nominations (closing on 29 July 2016). These community awards celebrate and reward some of the amazing individuals, groups, businesses, charities and organisations who help make our town ROYAL TUNBRIDGE WELLS and the borough a great place to live. Online/Printable Nomination Forms for "Love Where We Live"
"Helping Bees in Gardens and Parks"
will be held on Monday, 27 June 2016 (at 19:30-21:00) @The Hub in the Grosvenor and Hilbert Park. Apiculture expert, Professor Ratnieks from the University of Sussex, will explain the research which was done how best to help bees and pollinating insects in parks and gardens, studying bee behaviour and looking at specific plants and their attractiveness. 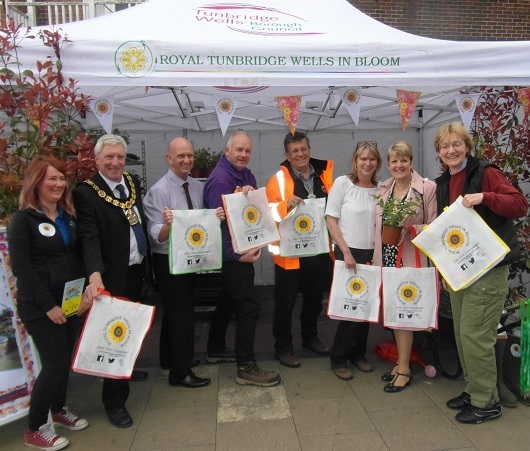 Royal Tunbridge Wells in Bloom campaign 2016 launched with promotional events on 8 April and 9 April at Calverley Precinct and on Bank Holiday Monday 2 May at the Family Fun Day at Grosvenor and Hilbert Park. BLOOM stalls received lots of visitors and it was great to see so many people interested in the campaign. We gave away in total 1300 of bedding and basket plants for local residents. Royal Tunbridge Wells town centre will be judged on Monday 11 July. Preparations for the judging day are in full swing. We will install far more hanging baskets, planters and barrier troughs then in previous years and community involvement at our parks has been great throughout the year. Results of South and South East in Bloom competition will be revealed in September. We are confident to win the Gold again! .... the result of planting 8000 bulbs on the "Townhall Green" last October! 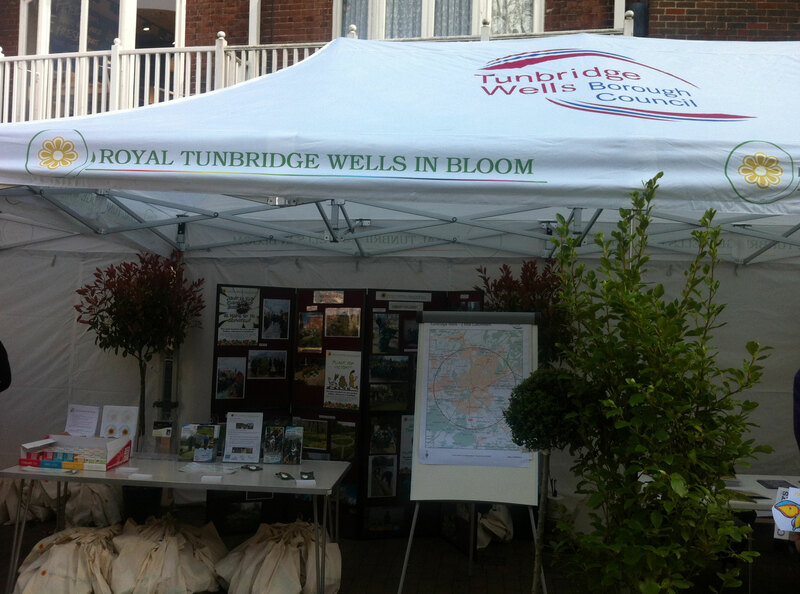 Another successful event promoting Bloom with the help of the Twitterati of Royal Tunbridge Wells! Royal Tunbridge Wells in Bloom 2016 campaign begins next weekend on Friday 8th April and Saturday 9th April, from 10am until 3pm in the Calverley Precinct, opposite Boots. It is an opportunity to meet the Bloom team, collect competition entry forms and free plants. Additionally, Claremont School offered art work. Free seed packets will be sent to the schools' gardening club. Tunbridge Wells Borough Council LOCAL magazine - Spring 2016 Many thanks to TWBC's Communications/Publications team. 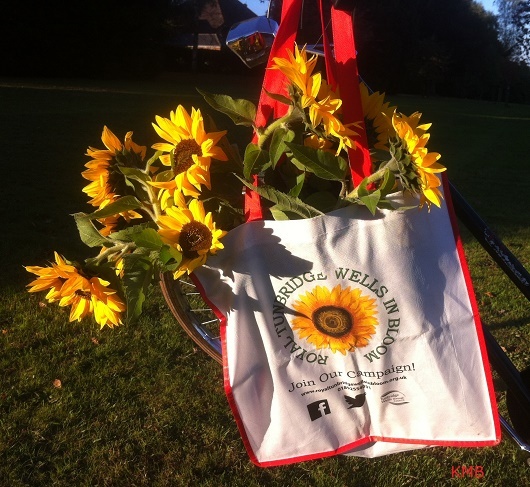 to add those colourful touches for spring launch"
Royal Tunbridge Wells in Bloom is a horticultural campaign and gardening competition, part of the South and South East in Bloom and nationwide Britain in Bloom. Royal Tunbridge Wells is being judged every July by horticultural experts from South and South East judging panel. .... and this year's BLOOM goodie bags are being prepared! Royal Tunbridge Wells entries for South & South East in Bloom have been submitted! Calverley Grounds, Grosvenor and Hilbert Park, TW Cemetery and the Common enter the competition for the first time in their own rights. "GET READY FOR IN BLOOM 2016"
Many thanks to Mary Harris, Kent and Sussex Courier. "RTW in Bloom - what's new? and latest News!" Everyone is welcome to join the Bloom campaign, to enhance the beauty of the town and to promote Royal Tunbridge Wells for residents and visitors. In preparation for next year's 2016 competition, the Bloom team will be planting spring flowering bulbs on the green on the front of Town Hall on Thursday, 8 October, 10am - 2pm. We need help as there are 8000 bulbs to plant! If you would like to help please let us know. Please wear suitable clothing and sensible footwear. We will provide gloves. End of September 2015 - start of the next BLOOM year! The competition is open to all schools of Royal Tunbridge Wells. You can access the photo album and download your pictures!! Over the past 15 years "South and South East in Bloom" has seen participation increase by 700%! .... and GOLD goes to ROYAL TUNBRIDGE WELLS (large town) in the "South and South East in Bloom" competition! Royal Tunbridge Wells in Bloom awards will take place at the Hotel du Vin on Thursday 24 September 2015. Residents, businesses and schools participating in this year's competition are invited to attend the ceremony (3:30pm-5:30pm). South and South East in Bloom awards will take place on 11 September. We have to wait until then ... Gold again for Royal Tunbridge Wells? Judging of the "Front Gardens" and "Planters/Balcony/Baskets" took place in Royal Tunbridge Wells on 21 July 2015. Judging of the "Schools" in the local competition took place on 29 June. 133 category entries (105 residential, 20 business, 8 schools) were submitted this year. TODAY - We are looking forward to welcoming the RHS Bloom judges in Royal Tunbridge Wells! For more information look on FACEBOOK "Royal Tunbridge Well in Bloom". Many thanks to Roger Kasper/Mary Harris from The Courier. "Important dates for RTW in Bloom"
Many thanks to Joe Challis. "Bloom competition - what's new? and latest News!" So far "RTW in Bloom" received 114 competition entries this year! Submissions were received from 93 residents (e.g. 20 front gardens, 20 allotments), 15 businesses and 6 schools (St Barnabas, Bishops Down Primary, St James' Infant, St James' After-school Club, St John's Primary, Oakley). There is still time to enter RTW in Bloom! We moved the closing date to 30th June 2015! RTW in Bloom has been part of the "Love Where We Live" initiative since the re-launch in 2010. Tunbridge Wells Borough Council's "Love Where We Live" awards 2015 are now open! >> Nominations close on 31 July 2015. 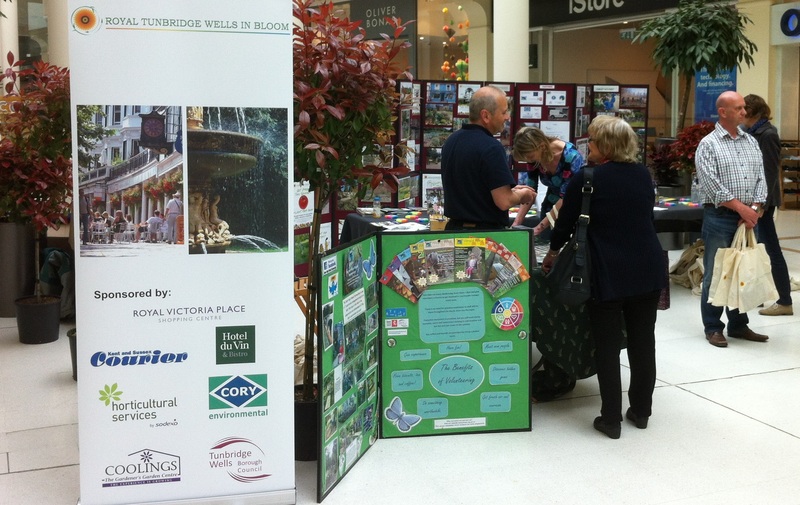 In case you missed the launch days of RTW in Bloom on 10 and 11 April do come along to our next promotion event in the Royal Victoria Place shopping centre (upper level, near Boots) on Saturday 9 May 2015. You will receive a 'goodie bag' with a competition entry form and you can find out more about this year's competition! Competition Entry Form has to be returned by 1 June 2015. We are pleased to announce - we have a new BLOOM sponsor! Hotel du Vin Tunbridge Wells will host the "RTW in Bloom awards ceremony" in the Ruinart Room (overlooking the hotel gardens and Calverley Ground) on Thursday 24 September 2015. Many thanks to Nikki Dorkings. >>> At the moment Hotel du Vin is just coming into their summer season; they have a special offer you might like to try out: "Al Fresco Menu" with 2 courses at £16.95 and 3 courses at £19.95; and you get a free glass of pinot when booking! The launch of BLOOM 2015 will take place @precinct (Calverley Road pedestrian area) on Friday 10 April and Saturday 11 April! - do come along to get your 'goodie bag' and find out about this year's competition! "Gardeners urged to dig for victory in bloom contest"
The 2015 Competition Form is out! Competition Form has to be returned by 1 June 2015. "Bloom is back, so dust off those gardening gloves and lets make Royal Tunbridge Wells ‘Best in Show’!" Royal Tunbridge Wells has received a gold medal for the third consecutive year in the Best Large Town category. The town also won the Kent Life County Award for the best town in Kent. Dunorlan Park received a gold medal in the Best Large Park category for the third time. In first time entries, Woodbury Park Cemetery received a silver - in the Small Cemetery category, while Barnett’s Wood Nature Reserve was also awarded a silver - in the Conservation category. Additionally, Woodbury Park Cemetery, Calverley Grounds and Grosvenor and Hilbert Park all won a Level 3 - in the "It’s Your Neighbourhood" competition. "Tunbridge Wells secures gold in South East in Bloom"
This year - 86 competition entries were submitted for Royal Tunbridge Wells in Bloom. Who will have in town the BEST basket, BEST Patio/Balcony, BEST Planter, BEST Wildlife Garden, BEST Front Garden, BEST Street, BEST Shopfront?? Judging will take place mid-August. Alton, East Grinstead, Hailsham, Farnham, Faversham, Ferndown, Haywards Heath, Ryde, Sittingbourne. Dunorlan Park participates again in the category 'Large Park'. come to a staggering total of 400! "Bloom 2014 is under way"
"Commemorating the First World War"
"IT’S THAT BLOOMING TIME OF YEAR AGAIN!" Saturday 12 April 2014 at The Pantiles. The Royal Tunbridge Wells in Bloom Campaign has now been incorporated into the Tunbridge Wells Borough Council's Corporate Plan. The aim is to embed the campaign as part of "Love Where We Live" and to get the Town, Council and residents thinking and planning what they can do to help promote this and to be proud of their town and the Blooms achievements. Royal Tunbridge Wells was invited to enter the National Competition in 2013 and achieved a Silver Medal. Oakley School was awarded Gold. Additionally Royal Tunbridge Wells won BEST TOWN in Kent. The winners for SOUTH & SOUTH EAST IN BLOOM will be announced on 11 September 2013; the awards ceremony will be held at the Assembly Hall in Royal Tunbridge Wells. The winners for BRITAIN IN BLOOM will be announced in Cleethorpes, Lincolnshire, on 12 October 2013. Royal Tunbridge Wells makes final of prestigious national competition. After two years of triumph, Tunbridge Wells is bidding to make it a hat-trick of wins in the South and South East In Bloom competition. Following last year's successes (achieving a Gold Award for the Town Royal Tunbridge Wells AND Dunorlan Park) Royal Tunbridge Wells will welcome the judges for "SOUTH AND SOUTH EAST IN BLOOM" again on Friday 12 July 2013. Additionally the judges for "BRITAIN IN BLOOM" will come on Monday 29 July 2013. A portfolio demonstrating the horticultural achievemnts, the efforts in our environment and community involvement was submitted. Oakley School, Pembury Road, Royal Tunbridge Wells, won Gold in South and South East in Bloom. 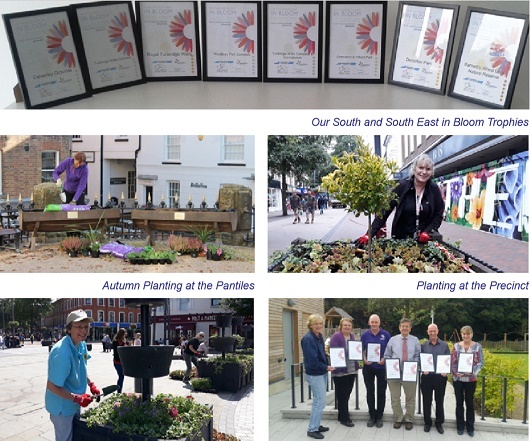 Royal Tunbridge Wells Town and Dunorlan Park are being judged in the South and South East in Bloom competition on Friday 12th July 2013 and we have been busy making final preparations including the compilation of a Portfolio to showcase our efforts! Flower power is on the agenda in Tunbridge Wells this year as the town is entering Britain in Bloom – a major contest celebrating the best communities in the country. The RHS (Royal Horticultural Society) is delighted to announce this year’s 78 Britain in Bloom finalist communities. These villages, towns (including ROYAL TUNBRIDGE WELLS) cities and urban communities so impressed their regional judges in 2012 that they have been nominated to take part in the 2013 RHS Britain in Bloom UK Finals. RHS Britain in Bloom represents the best of community gardening in the UK, with participants working together to care for their local environment, motivate people to get involved and plant up public spaces. Royal Tunbridge Wells will host the "South & South East in Bloom" awards on 11th September 2013 and "Royal Tunbridge Wells in Bloom" awards on 12th September 2013; both events will be held at the Assembly Hall. Britain in Bloom Finals - here we come! We are accepted in the National Finals in 2013! Judging will be in the first 2 weeks of August 2013, so about 3 weeks after the Regional Judging (South & South East in Bloom). "What a year for Royal Tunbridge Wells in Bloom"
The Awards Presentation for the 'Best' categories (basket, planter, front patio/balcony, front garden, wildlife garden, allotment, cafe/pub/club, shop front, street) took place at Salomons on Friday 28 September 2012. Royal Tunbridge Wells and the South & South East in Bloom Awards Ceremony 2012 in Farnham, Hampshire, Thursday 13 September 2012. Royal Tunbridge Wells has beaten all other large towns to scoop the South and South East in Bloom's Gold award. Dunorlan Park secured gold for the best large park. While Oakley School on Pembury Road won gold in the 'schools in bloom' category. The final award given to the town was 'Best in Kent' across all categories. Borough Councillor Ronen Basu, chairman of the Royal Tunbridge Wells in Bloom committee, said: "It is wonderful for the town to have been given these awards and confirms what people tell me when they say they think the town looks very beautiful. This is a prestigious competition and we should be very proud of our achievements." The bloom group in Tunbridge Wells has planted the troughs in Calverley Road precinct and organised community projects including hedge laying, spring cleans, a competition for residents and conservation work. The volunteers, staff and councillors were praised for their "hard work and support" by Council tourism and leisure chief, Councillor Jane March. Royal Tunbridge Wells participates in South & South East in Bloom 2012. Royal Tunbridge Wells won Gold in the category "Large Town", received Gold for Dunorlan Park (category "Large Parks") and the town Royal Tunbridge Wells is the Kent County Winner! The Awards Presentation for the 'Best' categories (basket, planter, front patio/balcony, front garden, wildlife garden, allotment, cafe/pub/club, shop front, street) will take place at Salomons on Friday 28 September 2012. Royal Tunbridge Wells, Mount Pleasant - We are getting rid of Grot Spots in a different way. Shop fronts are decorated with self-adhesive vinyl posters (photos by James Galpin). The Dunorlan Park Portfolio 2012 was submitted to the judges of 'South and South East in Bloom' on Monday 16 July and Friday 20 July. The Tunbridge Wells Borough Council's Environmental Sustainability Plan for Parks and Open Spaces (including Green Waste Recycling) was presented, too. 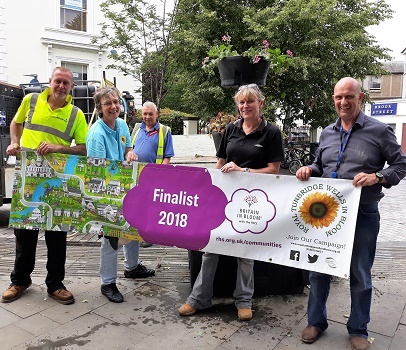 Organisers of this year's In Bloom competition will be keeping their fingers crossed next week (Friday 20 July), as the judges of the contest descend on the town. The town will be hoping to replicate last year's success when it won two top awards. Are we once again in Bloom? Following last years successes (achieving a Gold Award for Dunorlan Park and Silver Gilt for best Town) Royal Tunbridge Wells will welcome the judges again on Friday 20 July 2012. A portfolio demonstrating the horticultural achievemnts, the efforts in our environment and community involvement was submitted. Judging of the 'BEST' Categories will take place in July. The competition results will be announced at Salomons on Friday 28 September 2012. "Following the clearing of those beds around the play area we have been left with one bare bed [the other larger being the one turfed-over] with which we can do more-orless what we like. And, as part of ‘Tunbridge Wells in Bloom 2012’ (royaltunbridgewellsinbloom.org.uk) the Friends of The Grove are inviting anyone who lives near or uses The Grove to come up with some ideas – favourite plants, favourite colours etc, and produce a planting plan [with our help] for this spare bed." "Blooming Tunbridge Wells goes for Gold" — The Royal Tunbridge Wells in Bloom Campaign for 2012 has started in earnest and the team in this prestigious Olumpic year are GOING FOR GOLD (South and South East in Bloom). 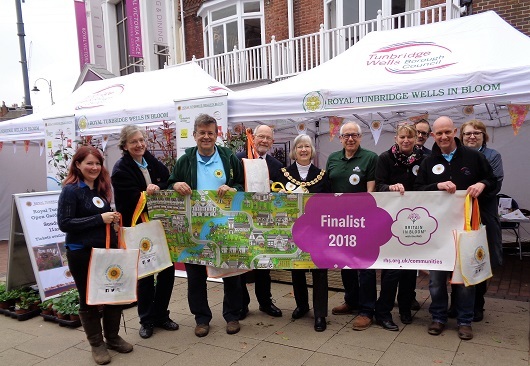 "Join community project to put splash of colour and civic pride back into town" — Chris Britcher of 'Your Tunbridge Wells' (Kentnews.co.uk) promotes again this year's project and its annual contests. The official launch of Royal Tunbridge Wells in Bloom 2012 will take place in Calverley Ground, Royal Tunbridge Wells, on Thursday 29 March 2012, 12am. Through co-ordination with Christine Davies Trinity Arts Centre organised a workshop at the theatre to promote the In-Bloom organisations and works. During the period 13.30 until 14.45, 16.05 until 16.45 children created 43 "Secret Gardens" and the event was visited by over 204 confirmed visitors. The event for Royal Tunbridge Wells in Bloom was held in the gallery at Trinity on 20 November 2011 and photographs are available to view online by visiting the link. "Royal Tunbridge Wells in Bloom" and "South East in Bloom"
"Royal Tunbridge Wells in Bloom" entered in the "Large Town Category" in the competition "South and South East in Bloom" and achieved a High Silver Gilt and 2nd place! At the Awards Ceremony (Wednesday 7 September 2011) the Chair of Judges acknowledged the gap in our entry of some 8 years and that to gain this level at our first time back in was no mean feat. "Royal Tunbridge Wells in Bloom" also entered Dunorlan Park in the Best Large Park - a Gold medal was awarded. All in all a fantastic result. All the long hours of many volunteers has paid dividends. It is great to be a small part of something that makes a real difference in the town! namely Alton in Bloom, Chichester in Bloom, East Grinstead in Bloom, Farnham in Bloom, Faversham in Bloom, Haywards Heath in Bloom, Ryde in Bloom, Sittingbourne in Bloom. The awards presentation will take place on 7 September 2011. "Judges come to town to pass their verdict on floral displays"
The Mayor Cllr Mrs Elizabeth Thomas welcomed the South East in Bloom judges; the tour lasted three hours and ended at the Dunorlan Park Cafe. South East in Bloom Competition: a portfolio was submitted and the judges, Linda Jones and Ken Fairview will visit Royal Tunbridge Wells on Friday 15 July 2011. Tunbridge Wells SO magazine looks at some of the stories making the headlines: "BLOOMIN' MARVELLOUS" - "Town pride will be blossoming again this summer with the return of Royal Tunbridge Wells in Bloom. The once popular competition was revived last year and was a great success, with residents and business pulling together to create a glorious floral spectacle. Containers, street flower baskets, barrier troughts and even roundabouts are set to boast fragrant displays as TW gears up for the contest. From schools to pubs, everyone is welcome to submit their beautiful basket, balcony, shop front or street. Anyone who would like to take part can pick up a leaftlet from Tunbridge Wells Gateway, before the closing date on June 27." Planting of the Pantiles tubs took place on Thursday 19 May 2011, at 11am and the children from Broadwater Down Primary School (last year's competition winner) came to help. The plants for the troughs (sponsored by Smalloads, Paddock Wood in 2010) were sponsored by The Rotary Club of the Pantiles and Tunbridge Wells Round Table. Sunflower planting will take place at Trinity Gardens on Tuesday 24 May 2011, at 1.30pm. St John's Primary School children and some children from St Marks Primary School who have grown the plants will come along and some members of Inner Wheel will join to help them. 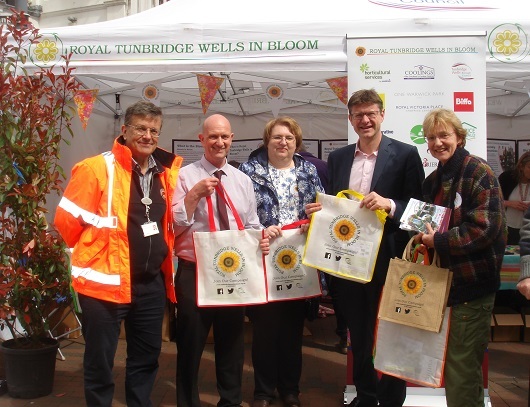 "MP Greg Clark launches Royal Tunbridge Wells in Bloom 2011"
"Sign up your open space to help make our town bloom"
— with Jenna Pudelek's community support in "Your Tunbridge Wells" / kentnews.co.uk Bloom is back for 2011. This year Royal Tunbridge Wells in Bloom takes part in the South & South East in Bloom competition. SSEIB is one of 17 independent regional campaigns which make up Britain in Bloom, Europe’s largest horticultural campaign. A portfolio has to be submitted by 25 June and judging day of the town will be 15 July 2011. Two weeks earlier than last year, planting day (3-tier planters/wooden planters) in the Victoria Place Precinct will be Saturday 14 May 2011, 10am! Again this year, Salomons will host and cater for the awards presentation of the various "BEST" categories on Friday 30 September 2011, 3pm. The SCHOOLS awards presentation will take place this year at Trinity on Wednesday 21 September 2011, 4pm. Illuminations, Camden Road, will support the "SCHOOLS" competition awards. Sutton supports the competition again by providing sunflower seeds and also some vegetable seeds. Tunbridge Wells Borough Council saves £3 Million on the new (10 years) parks contract which accounts for a massive 190 hectares of precious open space, woodland, play and sports facilities in Tunbridge Wells. During the negotiations the council also secured additional value through improved maintenance of all bowling greens and additional labour without further cost. This added resource can be deployed during the “off peak” period of January and February and will help to deliver the council aim of greater community engagement as part of the Big Society agenda. Local friends and community groups, such as Royal Tunbridge Wells in Bloom, will benefit from the extra help. Bloom 2011 and again supported by the Council ! The “In Boom” gathering at the Town Hall in Royal Tunbridge Wells (15.10.2010) by the Kent & Sussex Courier chief reporter Mary Harris. The Bloom Committee replanted the 6 large wooden troughs (sponsored in spring 2010) at The Pantiles with winter panies and yellow primula; Christopher Thomas provided the plants. The Bloom Committee and volunteers replanted the Victoria Place Precinct wooden planters and 3-tier displays with mixed coloured winter panies and primula; the Council's Parks Department provided the plants. A thank-you meeting took place in the Town Hall's Council Chambers, Royal Tunbridge Wells in attendance of the Mayor David Jukes, the Leader of the Council, Cllr Roy Bullock and the Chief Executive, William Benson. "Let's go Bloom! - again in 2011" — produced by Katharina Mahler-Bech [and Daniel Bech], was presented by Mel Henley to sponsors, contributors, volunteers and press. The Mayor David Jukes's welcoming speech was followed by the distribution of certificates to sponsors. The Bloom Committee asked for feedback. "Sponsors needed to help town blossom" — Jenna Pudelek of the Kent on Saturday & Sunday (KoS): "Now the hunt is on for sponsors to provide the financial backbone of the 2011 event and make it bigger and better than ever before. Next Friday 15 October 2010, a debriefing will be held in the borough council's chambers where organiser, participants and sponsors will begin discussions about next year's event." Cllr Roy Bullock, Leader of the Council, stated at the Awards Ceremonies that the Bloom Competition will be organised again in partnership with Tunbridge Wells Borough Council in 2011! Thanks to Targetfollow, at the Pantiles, hosting the event and providing refreshments. Thanks to Salomons, Southborough, hosting the event in the Victorian Science Theatre and providing refreshments. A Thank you & debriefing meeting will be held for Contributors, Donators, Organisers, Participants, Sponsors, Supporters and Volunteers in the Town Hall's Council Chambers on Friday 15 October 2010 16:00-18:00. Thanks to Salamons, Southborough, hosting the event and providing refreshements. there were 50 participants: 12 front gardens - 5 front patios - 6 community gardens - 7 commercial gardens - 7 streets - 13 planters / baskets. A big thank you to the judges walking around in the town! — Cheryl Clark, Paul Cummins, Christine Davies, Mike McGeary, Barbara Simmons, Vickie Gorst, Ronen Basu, David Scully, Heather Wexham, Julie Padbury, Leslie Herriot. Awards Presentation (nominatation of the Winner and the Runner-up) for the Schools will be held at the Pantiles, Corn Exchange, on Saturday 25 September 2010 15:00. As most volunteering judges for Royal Tunbridge Wells in Bloom have time in the week of 19 July 2010, the judging period is postponed. Awards Presentation for the 'Best' categories will take place at Salomons on Friday 24 September 2010 15:00. Monday 28 June 2010 is closing date for returning competition entry forms!! "Community spirit is blooming once again" — Jenna Pudelek of the Kent on Saturday & Sunday (KoS) reports about the planting day, 29 May 2010, in the Calverley Precinct of Royal Tunbridge Wells, in presence of the Mayor Cllr David Jukes and Mayoress Wendy Jukes. The long awaited new planting of the Victoria Place Precinct planters will be happening! Today is Farmers Market at the Town Hall / Civic Way! 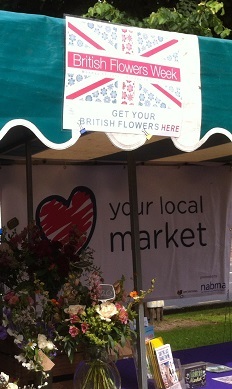 There are several stalls selling flowering plants, herbs, vegetable plants! "Fred and Edna Edwards have orgainsed work parties to clear the land at the back of TN2, terrace it with railway sleepers, and replant. This major landsacaping work is nearly finished, with funding from TN2 Trust, Cllr Frank Williams and from their own pockets. They have received some free gifts like topsoil from a building site in the area to fill out the terraces. It complements the trellis work and flower/pot arrangements on the decking area to the back of TN2 and the seed beds/potato pots that line the rear garden wall." today was planting of the edible landscaped triangle plot at the Town Hall, corner Monson Road / Civic Way.
. . . with enough sun and rain: the proposed Town Hall 'garden' . Watch out for Bloom Posters! Arriva Bus 281, the town centre shuttle bus or shopper hopper, and Arriva Bus 277, the Sherwood shuttle bus, advertise "BLOOM". Thanks to Katharina Mahler and Stuart Atkin, Arriva Bus Operations Manager Tunbridge Wells. Excellent News! — English Landscapes, the company maintaining the parks and grounds in Royal Tunbridge Wells, give free labour time and extra money to "BLOOM". Seedling and Seed Swap - on Saturday 8 May afternoon ((2-4pm). Bring your spare seed and seedling and swap them with other people's! meet just inside the main allotment gates. After having visited various shops at the Pantiles on 19 April 2010 (Daniel Bech and Ronen Basu), Imperial Pharmacy decides to assist "BLOOM" - particularly to brighten up the Pantiles with more floral displays. We are confident that an improved environment will have a positive impact on customers coming to the Pantiles. "Following a decision by Cabinet to allocate funding for the Tunbridge Wells in Bloom project, a small commmittee, chaired by Cllr Ronen Basu, has been working on the re-establishment of this much loved concept for the Town Centre. Meanwhile there is a fund of money available to Parish and Town Councils to assist in their participation with the Festival of Flowers." Woodbury Park Cemetery in Bloom — There are many snowdrops, primroses, scillas and wild cyclamens planted by the working parties of the Friends of Woodbury Park Cemetery. But there is still plenty of room for many thousand more snowdrops if you care to bring along your own spare bulbs “in the green” and a trowel on a Saturday afternoon. 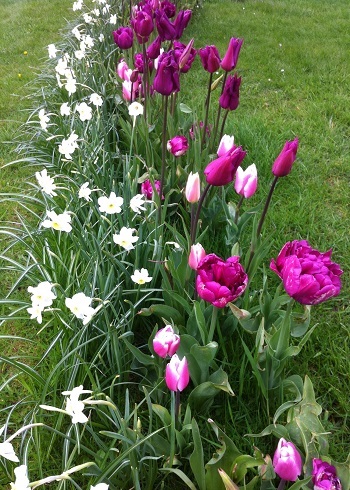 These plantings are a part of the contribution to 'Royal Tunbridge Wells in Bloom'. 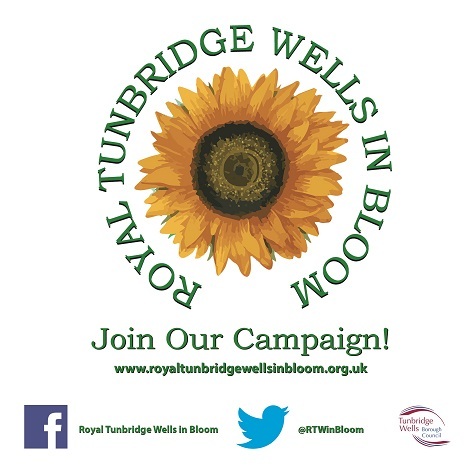 With the support of Targetfollow at the Pantiles and designed by Daniel Bech, large A1 Bloom Posters will be displayed in A-boards and the Information Drums, spread around Royal Tunbridge Wells, to raise awareness for Royal Tunbridge Wells in Bloom among residents and businesses. Thanks to Sue Latham of TWBC for arranging the posters at the various points. "Planting seeds for competition win" — The Courier helps in the appeal to motivate primary schools wishing to participate in Royal Tunbridge Wells in Bloom; the awards presenation for schools will be held at the Pantiles on Saturday afternoon 25 September. "Bloom competition is back" — Mary Harris of The Courier reports on the flower power from youngsters and their assistant headteacher Gill Field who is coordinating the Secondary Schools Competition. Judging will take place in July and the awards presentation will be held together with the Primary School Competition awards at the Pantiles on Saturday 25 September 2010. Christine Davies, coordinating the Primary Schools Competition, distributed sunflower seeds sponsored by Sutton Seeds. Judging will take place in July and the awards presentation will be held at the Pantiles' Corn Exchange, on Saturday 25 September 2010, 3pm. On 11 March, Daniel Bech agreed with Targetfollow to host the event and provide refreshments. Voluntary Action within Kent (VAWK) Community Newsletter March 2010 was distributed to over 600 community organisations via email. Small Loads Ltd from Paddock Wood agreed with Cllr Ronen Basu and Daniel Bech to deliver four of their large wooden planters to the Pantiles. Royal Tunbridge Wells in Bloom! - Kent on Saturday (KoS) publishes Letters to the Editor Chris Britcher. The official launch of riviving Royal Tunbridge Wells in Bloom took place in the Town Hall's Council Chambers, Royal Tunbridge Wells. "Let's go Bloom!" — produced by Daniel Bech, was presented by Mel Henley to contributors, press, sponsors, supporters, volunteers. The Mayor Cllr Leonard Price's welcoming speech was followed by the Leader of the Council, Cllr Roy Bullock's address. The Mayoress Victoria Price and Katharina Mahler provided snacks, soft drinks and wine. Daniel Bech agreed with Matthew Salomonson, the General Manager of the Salomons, that Salomons will host and cater for the awards presentation of the various "BEST" categories on Friday 17 September 2010, 3pm. Royal Tunbridge Wells in Bloom! This is the 2010 proposed planting of the Town Hall Triangle, Monson Road / Civic Way, Royal Tunbridge Wells by Transition Tunbridge Wells. "Town set to blossom as contest returns" — With Chris Britcher's community support in the Kent on Saturday (KoS) our PR and marketing is up and running. "Get your pots at the ready - bloom is back" — Thanks to Tunbridge Wells chief reporter Mary Harris & Ian Read, the editor of the Courier, our awareness campaign for the floral competition is progressing. At the Tunbridge Wells Borough Council's Full Council the Mayor Cllr Leonard Price promoted the revival of "Royal Tunbridge Wells in Bloom" to his fellow members requesting to raise awareness among their constituents and to attend the official launch on 5 March 2010. "The Royal Tunbridge Wells in Bloom competition is back for 2010 and will attempt to dazzle the community with stunning street flower baskets and revitalised roundabouts. The organisers will be working closely with local schools, communities and businesses for a wide variety of prizes including best front garden, best shop front or best pub/club/cafe! "I just wanted to say how delighted I was to hear that the Royal Tunbridge Wells in Bloom competition is being brought back to life this year. It’s a great opportunity for communities and schools to get actively involved in improving their local environment. 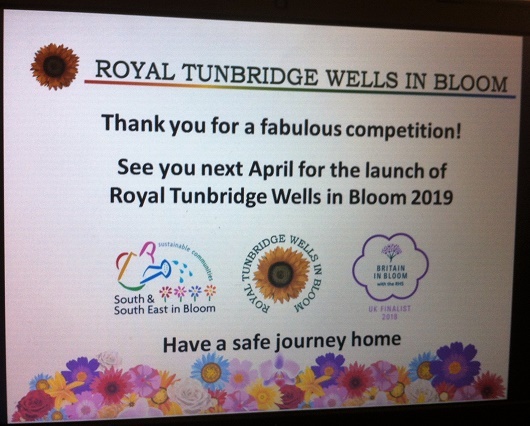 Royal Tunbridge Wells in Bloom is listed on the agenda of the Stronger Communites Sub-Group meeting of 'Tunbridge Wells Together' (Local Strategic Partnership). Stronger Communities Sub-Group members strongly support Royal Tunbridge Wells in Bloom. Thanks to Drew Davis, TWBC Publications Manager, our first batch of Poster-Flyers has gone to print. The design for the flyer was chosen from a series of submissions by pupils of Tunbridge Wells Girls Grammar School; the competition entry form was added. and mainly — START PLANTING!